The gastro-pub phenomenon, and the idea that pubs should have an extensive food offering and function more like restaurants was first seen in London, in the early 1990s. Two investors, David Eyre and Michael Belben took over a pub in Clerkenwell and promptly reinvented the place as both a lively night spot and den of great British food. The concept and term soon massively caught on; today every city worth its salt has a smattering of gastro-pubs, while London has hundreds. Even the hard to please Michelin team noticed the importance of gastro-pubs in the UK, awarding the Hand & Flowers two stars, for example. The Jugged Hare is one such venue that deserves a healthy and long life ahead. It probably isn’t going to win massive awards or gain a Michelin star, but then who cares? It offers a warm welcome, lovely comfort food and a lively atmosphere. Indeed, the Juged Hare is a pub for every occasion: lunch with colleagues, friends, a quiet drink, special dinner or a great night out. My first visit was one wet and grey Tuesday lunchtime in January this year, where I was quickly greeted by the charming manager, who promptly served us some craft ales while we perused the menu. Craft beer is something the Jugged Hare excels at – they brew their own, incidentally, while the choice of niche, high-quality brands is exceptional. The restaurant boasts a range of menus, including a theatre offering, bar menu, a la carte, ‘feast menu,’ and a generous Sunday lunch selection. Game naturally features heavily, in addition to the ‘offend no one,’ standbys of steaks, burgers and market fish – all unashamedly British, unfussy and delicious, comfort grub at its finest. Indeed, you might encounter Yorkshire pigeon bomb, roast whole game birds or perhaps the more prosaic ‘pie of the day,’ or whole roast Suffolk chicken. We plumped for crispy pig’s ears and black pudding croquettes to start, followed by the dangerously unhealthy burger and Cumbrian sirloin streak. The food was all uniformly excellent, again, nothing spellbinding but that’s not what I look for from a gastro-pub. I want to be nourished, satisfied, not spend a fortune (prices are reasonable) and simply have fun. 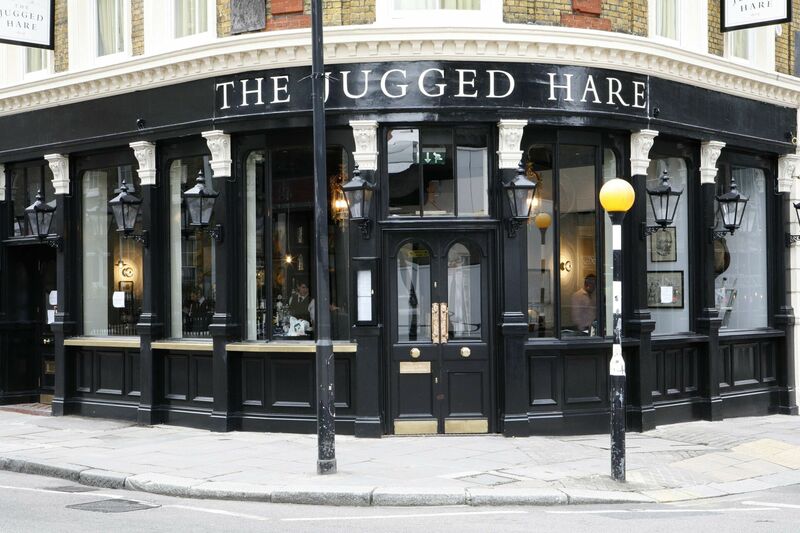 For the atmosphere at the Jugged Hare is exceedingly agreeable: buzzy without being overbearing and raucous. The service impresses too, friendly, fluid and chatty; making you instantly feel at ease. But what of the wine at this unpretentious space? An extensive list includes the fine and rare available by the glass thanks to Coravin – a device that allows your sommelier to extract wine without removing the cork. We indulged in an glass of Rioja from an exceptional vintage – all leather, violets and tobacco leaf. A rare treat indeed, especially as Coravin is usually the preserve of expensive, Michelin establishments. Too full for dessert, we nonetheless finished off with a glass of delicious dessert wine, before cheekily enjoying a few more beers at the bar area. Before leaving, our waiter came over to check we had enjoyed our meal, and shook our hands. A too often forgotten gesture that really meant a lot and, more importantly, has made me a Jugged Hare convert for life.